With notes of Vetiver, Amber and Tobacco, it's got a gorgeous smoky fragrance that will transport you back to country strolls past thatched cottages with peat fires in the hearth. Or in my case, my granny's old range where she burned sods of turf with the door open. It was mesmerising watching the flames while we sat eating warm soda bread dripping with fresh butter. However, unlike some peat fire candles on the market, Field Day Fireside has enough fragrant notes to ensure that it does not create an acrid smell in your home when burned for longer periods of time. Our Fireside candle has been in shops since April and the feedback has been overwhelmingly positive in terms of the strength of the fragrance and it's throw in large rooms. It's also great in a kitchen space to help mask those post dinner smells (or in my case, burning dinner smells!). 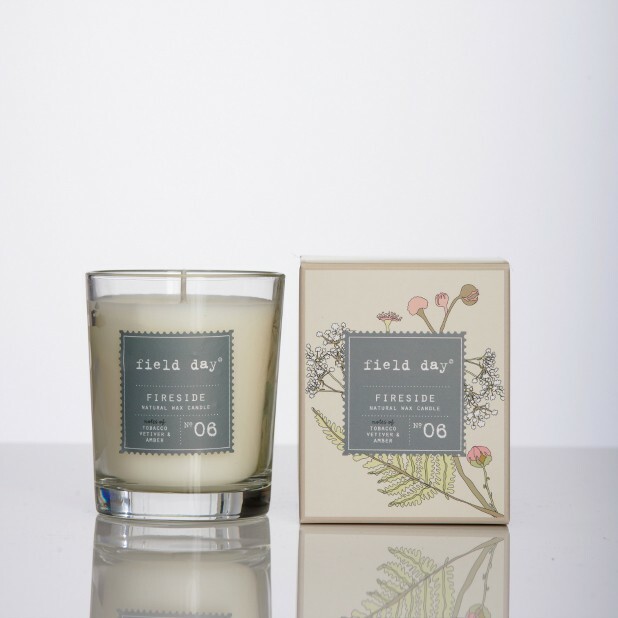 The Field Day Fireside Candle comes boxed inside our signature Field Day floral packaging and will give you approximately 40 hours of burn time. It retails at £13.95/€17.95 on this link. Free delivery is offered on all orders over £30 within the UK and €40 within Ireland. The full Field Day range is made in the rolling hills of County Down using a vegetable wax blend and cotton wicks. Previously called Bog Standard, Field Day has been making candles for over a decade and all of our products are inspired by the beautiful Irish countryside, with indigenous fragrances throughout the collection. Our full range of hand care, home fragrance, soaps and candles can be found on this link.